about ten years ago at the beginning of my journey in photography. I met Bryan, initially through his amazing instructional photography books. I found his books to be entertaining, engaging, and easy to understand. Many of his books line my bookshelves and helped form the foundation of my photographic skills. Since first discovering Bryan in the pages of his books, I have been able to learn from him by attending his presentations and as a participant on two of his photography workshops in the United States. In person, Bryan’s passion for photography and creativity is infectious. I knew Bryan had lived in France for many years, so it just seemed to be the perfect choice to learn from Bryan while exploring Provence. We spent a great deal of our time in Provence photographing the blooming sunflowers and lavender. Bryan has a way of teaching concepts such as using a fast shutter speed to freeze action in an entertaining way. 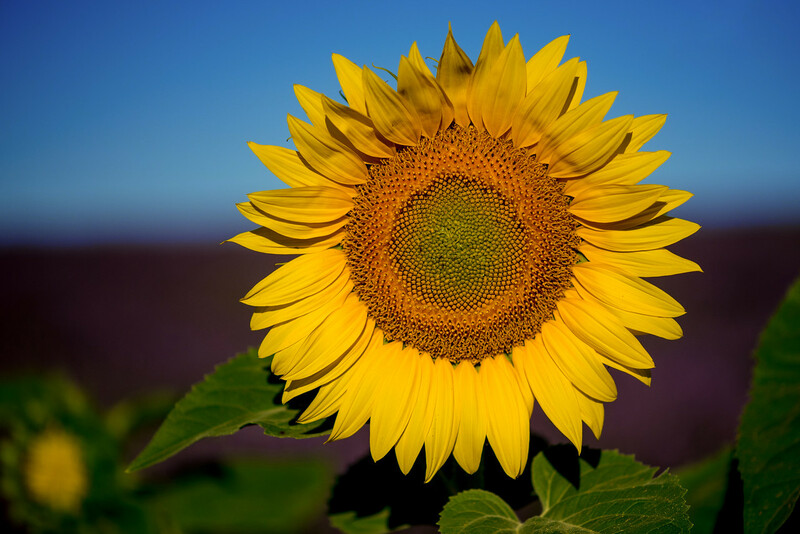 I typically spend every summer photographing in sunflower fields. 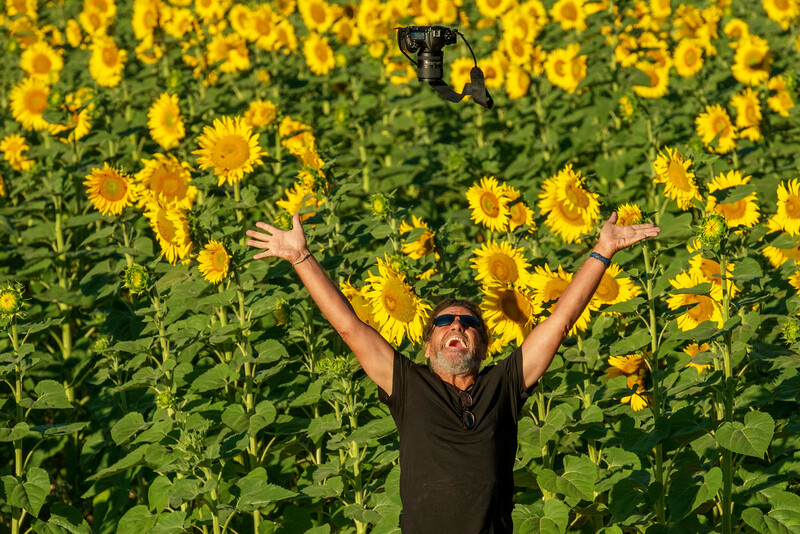 While in Provence, I wanted to create an image in the sunflower fields that I am not able to create at home. Using the lavender in the background, I was able to do just that. We spent hours photographing the lavender. It was challenging trying to find different compositions of the lavender. 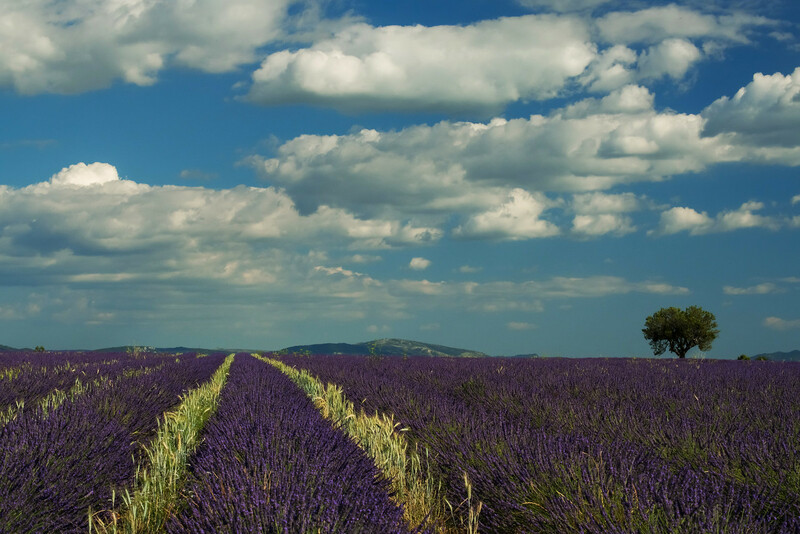 It seemed natural to begin by shooting the ever-popular lavender and lone tree. Once I had some of these compositions out of my system, I was able to look for other compositions. 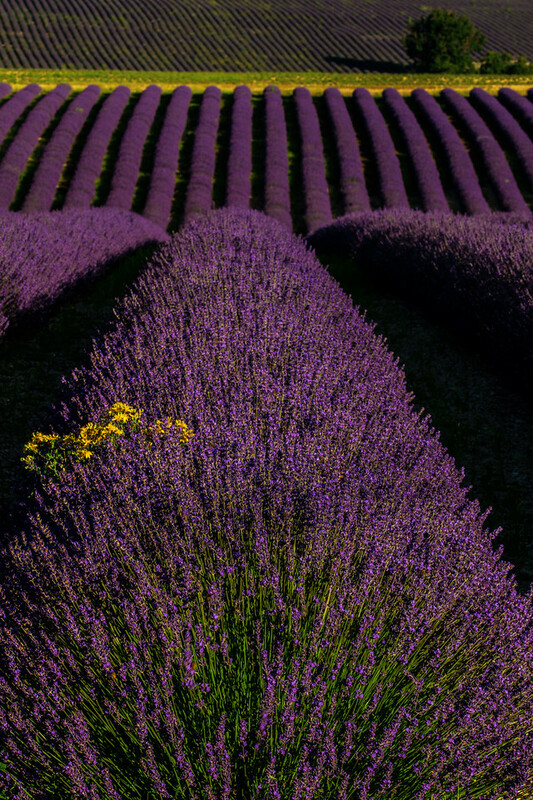 I found this little splash of yellow really made this close up composition of the rows of lavender. Purple and yellow are complimentary colors, located opposite of each other on the color wheel. The combination of these two colors is always pleasing. 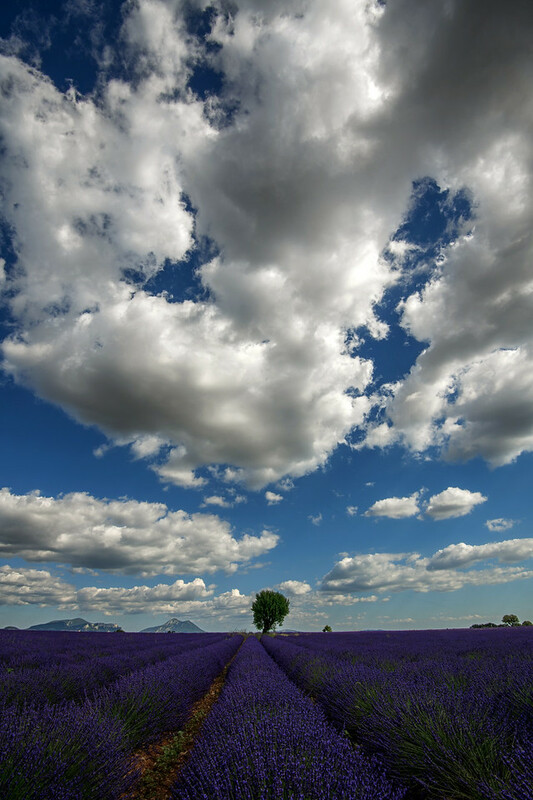 One of my favorite shots in the lavender fields was less about the lavender and more about the gorgeous, cloud-filled sky that we encountered that day. Since the clouds were holding my interest most, I allowed them to fill the majority of the frame. 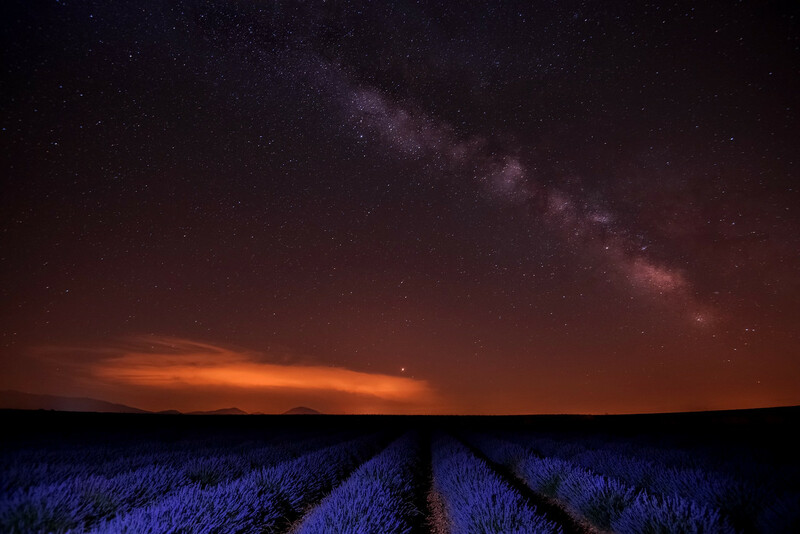 One of my favorite memories from the workshop is the evening we spent in the lavender fields in order to photograph the lavender with the Milky Way. 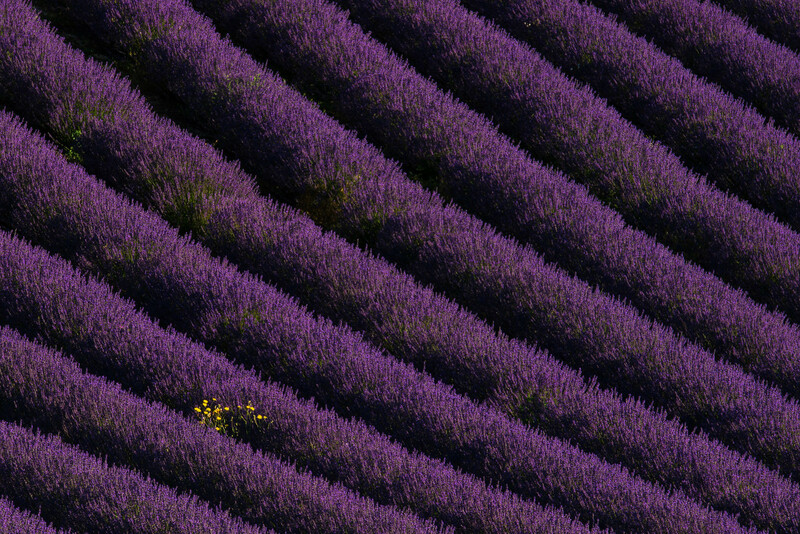 I wish I had taken a picture of the line of photographers spaced out across the rows of lavender that evening. Bryan has already sold out this workshop for this coming July. If you ever have the opportunity to explore Provence or any other area with Bryan, I would highly recommend that you do. My memories of the workshop experience in Provence, France with Bryan, the friends I traveled with, and the friends I met at the workshop will be one that I will always treasure. I am a travel and fine art photographer living and working in the Carolinas. My camera has taken me to places I never would have experienced and to people I never would have met. Photography has truly changed my life! Using my blog, I hope to share the joys of both travel and photography. Beautiful pictures, Mary! Love the sunflower and the lavender together! Oh Mary, these are so marvelous. My favorite is looking down on the lavender but they are all great. I have been looking for a great workshop to go to and if you could hook me up with a way to find some I would be grateful. Sometimes I can look at your art and be so uplifted but other times when I am feeling not so good about myself I cannot look because I know I will never be as great of a photographer as you. But mostly you encourage me. So happy you were able to attend this workshop. Keep shooting. Thank you, Jennifer, for your kind comments! I think what has helped me the most in my journey of photography is to look at my work and try to improve to my next step rather than comparing my work to anyone else’s. We are all on our personal journeys. Share your heart through your lens. I will send you an email in the upcoming week with some workshop suggestions. I hope our paths cross again soon! Such talent. Thanks for sharing. Love the yellow and purple combination. I always love purple with lime and red. Thank you, so much, Helene! Beautiful images and very well said! It was a lovely adventure. I’m so glad I was able to experience Provence with you Mary! Thank you, Michele! It was such a special time! I do feel like I walked away with friends who I will see again! An amazing read and captivating, stunning photographs!! Thank you, kindly, Angela! How many words have you already completed:)? Beautiful images as always Mary. Thank you, Dan! I hope you have an amazingly photogenic weekend! MP-You just keep getting better & more better! ALL the images are incredible-best ever! I met Bryan at CNPA years ago, have one of his books, find him so inspiring & energetic and creative extraordinaire. Thank you for sharing the experience. Over the top, filled with awesomeness. Ron, I greatly appreciate your comments! I am so enjoying your Maine images. Thank you for taking me back to that special place!